The Vostok 3KA-2 space capsule shown here was sold for nearly $2.9 million in a Sotheby's auction to Russian businessman Evgeny Yurchenko. The spacecraft flew in space in March 1961, 20 days before the historic April 12, 1961 launch of cosmonaut Yuri Gagarin on the first human spaceflight. NEW YORK - A vintage Vostok space capsule is headed back to its homeland with its new Russian owner, who bought the relic of the early days of human spaceflight for nearly $2.9 million during Sotheby's auction Tuesday (April 12). It is believed to be the most anyone has ever paid for a space artifact. Yurchenko, who is the chairman of the investment fund AS Popov, paid a total of $2,882,500 for the Vostok 3KA-2 space capsule, and plans to return it to Russia, Sotheby's officials said. The Vostok auction set an apparent record for space memorabilia sales and is one of the few examples of space memorabilia that have sold for more than $1 million. "Based on sale results for the past two decades, Vostok 3KA-2 is believed to have set the record for the most ever paid at a public sale for a single space artifact," said space history expert Robert Pearlman, editor of the space history and memorabilia website collectSPACE.com. Pearlman is also a SPACE.com partner. "It surpasses Sotheby's own sale in 1996 of a more modern Russian Soyuz capsule for $1.6 million," Pearlman added. "That spacecraft, purchased by Ross Perot's foundation, is now on loan and displayed at the National Air and Space Museum in Washington, D.C."
Sotheby's officials expected the space capsule to be sold for between $2 million and $10 million, the auction house had said. "As the only Vostok to have been in the U.S., 3KA-2 offered many Americans a first and only look at the world's first crewed spacecraft," Pearlman said. "The Vostok 3KA-2 space capsule is a historic artifact of the Soviet space program," Yurchenko said in a statement. "Its successful return to Earth from space gave the green light for Gagarin’s spectacular achievement. Until now, the Vostok 3KA-2 space capsule was the only one of its kind outside of Russia, and with the support and participation of Sotheby's, I will be able to bring it home." Yurchenko said it was especially meaningful for him to buy the Vostok capsule on the anniversary of Gagarin's spaceflight. 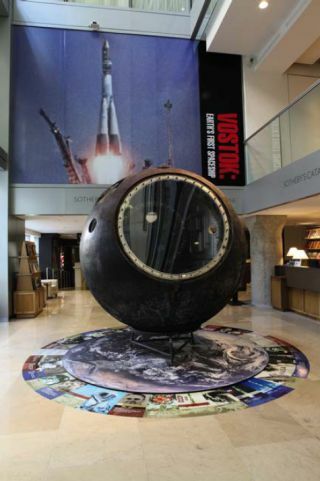 "I hope that Vostok will take its rightful place in one of the national museums devoted to the history of the formation of the Russian space program," Yurchenko added.